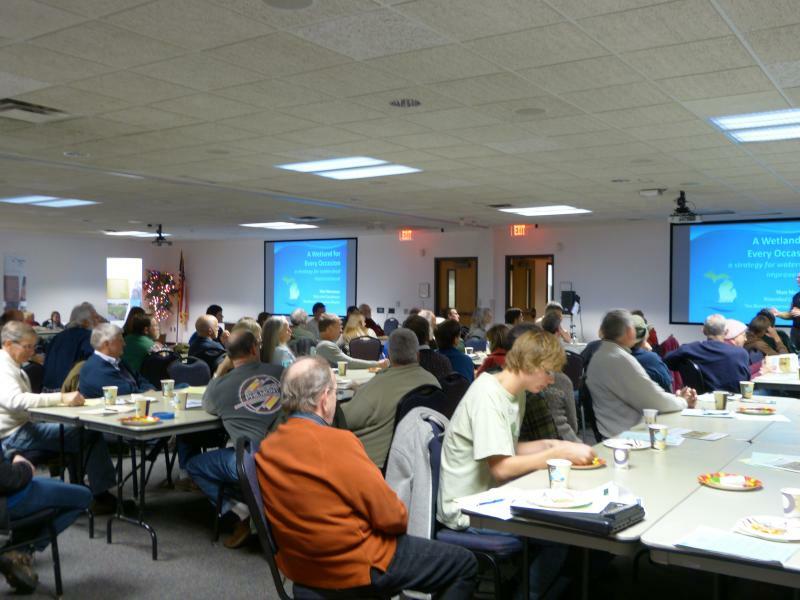 Another large crowd attended the Two Rivers Coalition 4th Annual Meeting last month. I always love the energy and sense of possibility at the TRC annual meetings. As usual, it began with people milling about looking at poster exhibits and slides, eating dessert, and talking. A little casual eavesdropping revealed that all the seemingly disparate conversations had a common thread: protection of our precious freshwater resource. Marcy Colclough [our "Queen of Green"] started the meeting off by listing the various activities and accomplishments of TRC in 2012. I was impressed not only by the large number of activities that TRC sponsored, either on its own or with our partners such as Southwest Michigan Planning Commission, Van Buren Conservation District [VBCD], Southwest Michigan Land Conservancy [SWMLC], Van Buren Drain Commission, etc. but by the wide variety, as well. For example, TRC hosted paddle events [a big thanks to Kenneth "Kayak" Nesbitt] on both the Black and Paw Paw Rivers designed to get people out on the water to appreciate up close and personal the beauty of these streams. 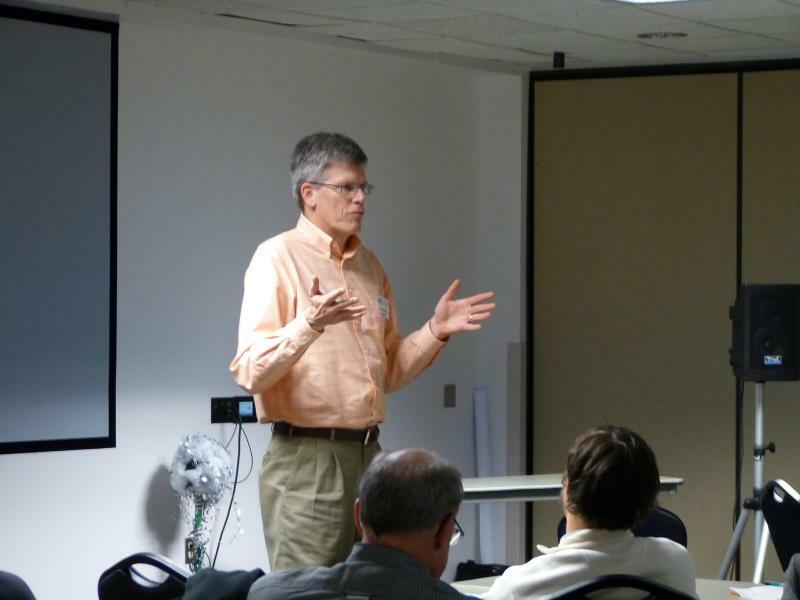 TRC helped sponsor programs featuring speakers on interesting and timely topics such as climate change and coastal invasive species. TRC volunteers helped with a pilot project to monitor E. coli on both rivers and to then do DNA testing to try to determine the source [stay tuned for results in a few months]. Of course, we were out there on both rivers participating in River Rescue Day in August removing huge amounts of trash. And these cool projects are only a small fraction of the activities by TRC and its volunteer members with a lot more planned for 2013. Matt Meersman then spoke and made a startling admission: He is CRAZY about wetlands. He described the vital functions of wetlands [filtering, flood control, sediment trapping, and habitat] and explained a project that VBCD is working on to map and assess local wetlands with a focus on their functionality. For example, they have learned that our area has lost 56% of its original flood storage capacity. When you combine this with the fact that so much rain now falls on hard surfaces [such as paved parking lots and roads] which permit no absorption and channel every drop of water to ditch, drain and, ultimately, the river, you have a recipe for flooding. Not surprisingly, the single biggest pollutant in our rivers is sediment. A whopping 44,000 cubic yards of sediment is deposited annually in the harbor at St. Joseph and 25% of that comes from the Paw Paw. What if some of the hundreds of thousands of dollars that is spent each year on dredging the St. Joe harbor were instead to be used upstream to promote best practices that reduced soil run-off? Matt described an exciting project on the Paw Paw River where grant money is being used to permanently protect from development some of the most important remaining wetlands in the Paw Paw watershed. Earlier this year, TRC President Dave Foerster placed a conservation easement on a 350 plus acre parcel of high quality floodplain forest that he owns in Waverly Township. A conservation easement guarantees permanent protection from subdivision and development while still leaving the property in private ownership. This means that some of the highest quality wetlands in the entire Paw Paw watershed will continue to do their job of filtering, absorbing and providing habitat IN PERPETUITY. 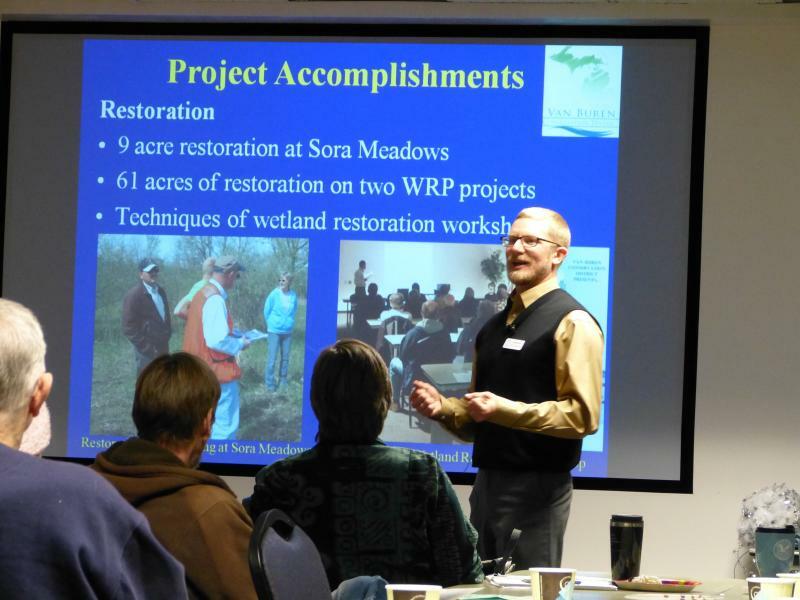 Tom also excitedly discussed a TRC project called "Waterfront Wisdom" which encourages riparian landowners to leave buffer strips of native vegetation at water’s edge. These strips help filter run-off before entering the watercourse, in addition to providing crucial habitat. Tom emphasized the importance of breaking the "lawn to lake syndrome" which makes the shores of many of our local lakes look more like one continuous putting green. As Tom puts it, "We have to make protecting wetlands part of the culture". People often want to do the right thing, especially in their own backyard which is always the piece of land we love most dearly. Tom encouraged TRC to find these "early adopters" of good management practices and promote them as good examples to their neighbors. Tom’s remark about local people who are doing the right thing with their land got me to thinking. Wouldn’t it be interesting to meet and talk to some of these people: farmers experimenting with no-till agriculture, home owners putting in rain gardens, local businesses using porous pavement? So my plan this next year is to track down and interview these folks and write some articles to appear here on the TRC website. Even when Tom finished speaking, people didn’t want to go home. Many stayed to talk and continue munching on desserts. One group led by Frank Jurenka was discussing TRC’s plan to put up road signs alerting people that they were entering a watershed [Black River or Paw Paw as the case might be] and reminding them that all water eventually flows to the river. Sam Ewbank was discussing the next TRC fundraiser [TRC sells beer and wine at music events at Foundry Hall in South Haven]. John Mitchell was explaining the Bangor/South Haven Heritage Water Trail Association’s plans for clearing more miles of the Black River for paddling. Joe Parman, our county drain commissioner, was explaining how to receive reductions in assessments in exchange for putting in buffer strips around drains. And, of course, Kenneth Nesbitt was recruiting for the next TRC paddle trip [a "polar bear paddle" in March]. All in all, it was another great annual meeting!